This is a good soup, and not only because it makes use of the ever-popular kale. (In truth, I almost used a different green on principle alone; I do hate to conform.) It's fairly basic but super flavorful, containing nearly all of my favorite herbs. Plus, I find that white beans cook up quite nicely, staying soft but still retaining their shape and not turning into complete mush. You can start with a mirepoix, or course; I didn't have any carrots, so I skipped those. Feel free to bump up or dial back the garlic as you see fit. I mentioned that this soup contains almost all the best herbs (rosemary and thyme are numbers two and three behind only cilantro on my list) but if you prefer others, go for it. If you use tarragon, though, we can't be friends--that stuff's foul. In a large soup pot, heat the olive oil over medium heat. Saute the onion, celery, and garlic for 3 to 4 minutes. Season with salt and freshly ground black pepper, to taste. Add the potatoes, cannellini beans, and chicken stock. Using kitchen twine, tie the herbs and the bay leaf into a bundle and add to the pot. Season with the red chili flakes, salt and pepper. Cook for 15 to 20 minutes, then add the kale. Continue cooking until the beans are completely tender but not disintegrated. And hey--don't forget to fish out the bundle of herbage. Nobody wants to eat that. You've managed to make this bean soup very photogenic! Nicely done. Se ve fantástica la receta. A very satisfying and delicious soup! Se ve fantástica y reconfortante adoro las sopas,hugs,hugs. Since 2009? Really? I haven't let the unphotogenicness of soup stop me. Silly spellcheck thinks unphotogenicness is not a word. Love this soup look tempting!! It's so true...soups are almost IMPOSSIBLE to photograph! But yours looks so hearty delicious! You're right - soup recipes can be difficult. Many times I just throw stuff in the pot and don't really measure... 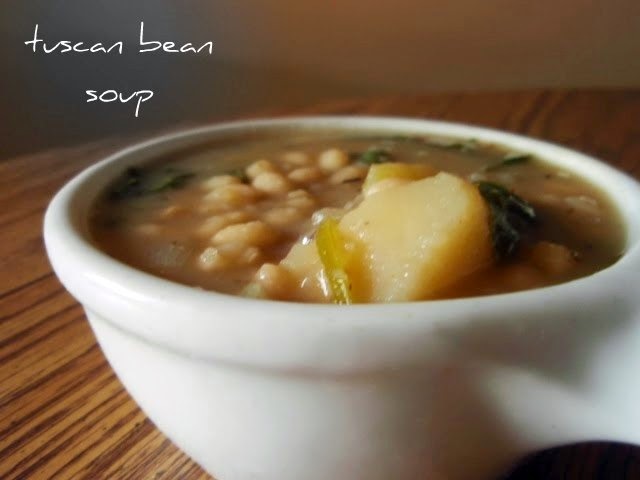 This bean soup looks really comforting and yummy. I feel like I can taste this soup, It sounds and looks wonderful! I love love love soup too. I always forget to blog about it! This looks scrumptious! I love bean soup. It's one of the soups my mom made alot as a kid, always a favorite! As soon as the temperature dips down here in Iowa, I want to make this. It reminds me of my favorite Italian soup. Yum! Kale and white beans are lovely together! What a great mix of hearty and healthy in soup form. The soup looks very comforting and loaded with flavors...love the creaminess of this soup. Hehe well I'm glad that you used kale (even though I did think "Oh Grace is a rebel" even unconsciously!). This looks like a hearty soup! I am getting ready to start planning my soup-making for fall (can you believe that?!). I love the inclusion of greens since I will have kale and swiss chard in abundance soon!